Freelancing is a Three-Legged Stool – Jodi Helmer – Writer. When I started freelancing, I signed up for a one-on-one mentoring session during the ASJA conference. My mentor shared an analogy with my that has become the cornerstone of my freelance business — and one I encourage other writers to adopt: Freelancing is like a three-legged stool. Each leg of the stool represents a different element of your freelance business: The work you do for love, the work you do for money and work that is related to writing but not writing. * I write about farming/sustainable agriculture and dogs for love. In general, the magazines that publish articles on these topics tend to pay lower rates. Since the subject is a personal passion, I love interviewing sources, researching new topics and trends and putting together articles that will benefit readers–but I can’t make a good living writing about conservation tilling and choosing the right farm dog. * I write brochures, press releases and certain magazine articles for money. Making a good living is important to me, which means I make some decisions based on my bottom line. Writing for money isn’t as soulless as it sounds. I often learn something new and work with great editors/content managers but the work is often less personally fulfilling. * Teaching/coaching is the third leg of my stool. It’s an essential part of my overall business mix — and it’s work that I love — but it’s different than writing articles. Other writers teach fitness classes, design websites and offer copyediting services. The third leg of the stool is less about supplementing writing income (although that is one of the benefits) and more about kicking off the bunny slippers and getting out into the world. For a three-legged stool to balance, all three legs must be (approximately) the same length. 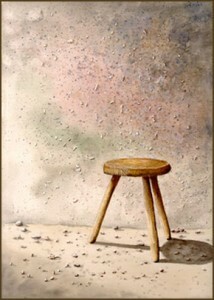 If one leg is too short, the stool will wobble or topple over. In other words, you can’t build a sustainable writing business by only building one leg of the stool. Spend too much time writing for love and the cupboards will be bare and bill collectors will come calling. If you only write for money, work will feel like a chore (even with casual work attire and flexible hours). Focusing on the third leg of the stool will take you away from writing. It’s hard to research queries and write articles — for love or money — if all of your time is devoted to teaching or making coffee. As you launch or build your freelance career, how will you build (or readjust) the measurements of your three-legged stool? Brilliant. As someone interested in learning the business of writing, I am also determined to learn the heart of writing as well. Thank you, Jodi. The 3-legged stool analogy will stay with me as I venture into unchartered territory; I believe it will help me achieve the proper balance. Great blog! I’m so glad that the analogy resonated. I first heard it more than a decade ago and still use it as a touchstone in my writing business. At times, my stool gets out of balance and I always return to the image of a three-legged stool to ask myself what steps I need to take to realign my freelance work for a more balanced stool. I hope it’s as helpful for you. Good luck with your transition into freelancing; if I can help, please let me know. This is a really smart article. Glad I found it. I have a question, though. Is it necessary to have the third leg? Why do I have to try another job if Im already a writer who has nice income and like what I do? I mean, nurses and end engineers do not need to find another job right? Thanks! I’m glad the article resonated. You’re right: Nurses and engineers don’t need to find a second job — and I’m not suggesting writers take on a new/different job to supplement their income. In fact, I believe exactly the opposite: I’m a huge advocate for writers taking the leap to full-time freelancing because it’s possible to make a great living as a writer. Instead of thinking of the third leg as another job, think of it as using complementary skills to add a third dimension to your work. For example, you might write books. It’s obviously still writing but it requires a longer-term commitment and different approach than writing articles. The third leg of my stool is teaching freelance writing workshops and coaching other writers. The most important takeaway from the post is the need to balance the work you do for love and the work you do for money (unless you’re making a great rate writing about topics that you’re really passionate about, in which case, you’ve won the freelance lottery). Thanks for the thoughtful question.